Brown, Blonde, Blackish, Red, Orange, Pink I've always played with my hair color. It started in high school when my friend and I were experimenting with a home kit in her bathroom. She had decided I would look good as a coppery red head so we tried it out and this started my love affair with changing my hair. 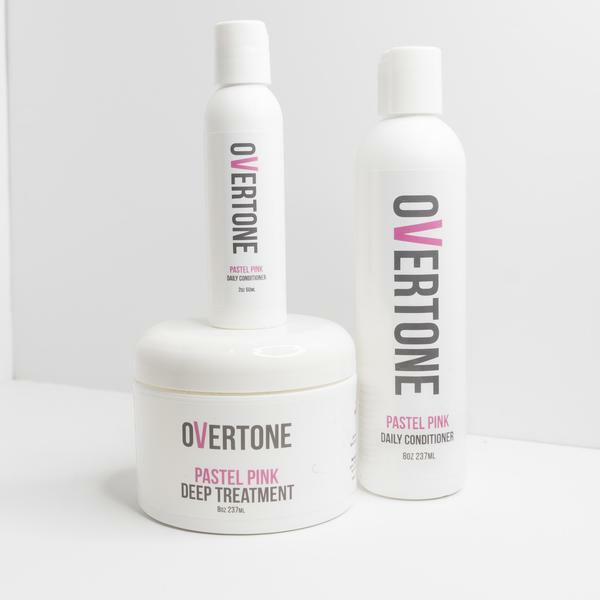 Overtone sells three levels of pigmented conditioner: pastel, vibrant and extreme with daily conditioners or weekly deep conditioners. Daily versions have less pigment than weekly. I use mine every few weeks and then let it wash out so that i can enjoy the different colors as it washes and fades out. They have so many fun colors, teal, lavender, silver, peach, rose gold. With 24 colors in all, the sky's the limit. There's one caveat, it will show up better on bleached hair. I get my hair balayaged a few times a year and then paint on the conditioner onto my highlighted hair. I then let it sit for various times depending on the intensity of color I want to achieve, up to 30 minutes or so and then wash it out and occasionally shampoo and then air dry. Overtone helps to make it fool proof by showing a color swatch of how the various colors turn out on lighter to darker hair. Try it yourself! I'm giving one Overtone Pastel Pink Complete Set of : Daily Conditioner, Deep Treatment and travel size conditioner. Enter on my Instagram @jannaconner to win! Summer time is a great time to for travel, whether that means local trips or to far away locales. My husband was born in Belgium but grew up in Paris so we make a trip back to both countries to visit family every year. I love to travel but I hate to pack all my toiletries! I'm a total beauty junkie so it's very hard to narrow down my daily arsenal to pack for a trip. (I've never been accused of being a light packer...Just ask my husband!) Now that I have a child whose stuff I have to lug along as well, I've been forced to pare down to the essentials. Here are my tips for making your toiletries bag a little lighter! When choosing items for traveling, focus on two things: size and durability. The smaller the better and nothing that is delicate. Leave your fabulous eye shadow palettes at home, they will most likely crumble and make a mess of your cosmetic bag. When I travel I love to use my makeup in stick form. Summer is all about easy beauty and I love that with sticks you can just swipe and go. I like the Smashbox Studios blendable lip and cheek color in L.A. Lights /Silver Lake Sunset. One because the name is great, (I love LA!) and two because it has a mini sponge that you can use to blend the stick into your face for a seamless application. It's a pretty, natural color great for a flushed glow, (it's a little too pale for lips though so I don't use it for that). I also love Bite Beauty for it's natural products and creamy lipsticks. They make all their products to be food grade because the average woman consumes 7 pounds of lipstick in her lifetime. Yikes! Each Bite lipstick is infused with the age-fighting antioxidant resveratrol — the equivalent of five glasses of wine. I've always liked to drink my wine but now I can wear it/eat it too! What's great about this Bite Beauty mini stick is that it's small and can fit in your pocket and has 2 different colors, one lighter for day and more dramatic for night. In the summer I get shiny, especially with all that sunscreen. I like to carry this mini Make Up For Ever setting powder. It's so small and I just shake out a teeny bit to tone down any unwanted t-zone shine. My daily routine would not be complete without a highlighting product and this one by RMS Beauty is great for traveling. All natural and made with coconut oil, this travels very well because it's hardened in a pot and not like liquid tubes which can explode or get punctured and spilled. I've had this happen and it's a b*@#% to clean up! Apply this to the inner corners of your eyes, under the brow bone, the cupid's bow of your lips, bridge of nose, middle of forehead, chin, and top of cheekbones and blend. It will give your skin a dewy, radiant not shiny or glittery appearance. Love! Last but not least, the Clé de Peau concealer can hide a multitude of sins, from jet lag to blemishes. I had a bit of sticker shock with regards to the price, but I have to admit that it's the best I've used. It's creamy and blendable and very long lasting. Some concealers slide right off or if they're long wearing can be too drying or cakey but this one is the perfect consistency. Love the stick formulation, it's perfect for traveling because it won't spill all over your bag. Flawless makeup doesn't happen without a great base of healthy skin. I like to wear less makeup in the summertime so I try to make sure to take extra good care of my skin. Since I'm a beauty addict, I have a lot of samples that I've accumulated over the years. These used to pile up but I realized that they make great travel partners. That way I can take everything I want face masks, face wash, oils, shampoo etc. without taking up tons of space and it actually makes your bag smaller by the end of your trip because you throw things away as you finish them! It's also a great way to try out new products and see if you like them. Plane rides can be extremely dehydrating to your skin so I use this Sisley Black Rose Cream Face Mask on any long flight and made sure to drink a ton of water. One sample has quite a bit in it, enough for probably 1-2 applications depending on how much you apply but I just use the extras on my neck and on the back of my hands, and since it's so dry on the plane they both were absorbed pretty quickly. This rose mask applies more like a heavy lotion, don't rinse or tissue it off just leave it on. I also wouldn't normally recommend carrying a bottle of oil but I absolutely love this almond oil from L'Occitane. I first used this when I was pregnant to prevent stretch marks (which it did) but still use it to moisturize all over my skin and even the tips of my hair and cuticles. I love a multi-use product! I typically use an anti-oxidant serum before my sunscreen everyday so I love that this Anthelios AOX by La Roche Posay has a SPF 50 and a built in serum. It eliminates an extra step and an extra bottle in your bag. The sunscreen has a great consistency and blends well and isn't tacky to the touch. It's also priced very well at under $40 which often serums alone would cost at least that alone and usually more. To touch up my sunscreen during the day, I love to use Supergoop Setting Mist in SPF 50, I just spray it on and it sets makeup a a bonus. I love the travel size, I just throw it in my purse so I'm never without sunscreen. I love to wear fragrance and if I'm not going on a long trip I take travel perfume bottles from Sephora. They work great and you can just spray in any one of your favorite fragrances. I was gone for 3 weeks though so I needed something a little bigger. My current fave is Jo Malone Mimosa and Cardomom and I love that it comes in a small bottle! I used to always buy big bottles of perfume but found that when you buy the smaller sizes you end up using them up quicker before they expire and are free to experiment more with different scent combinations. I first got eyelash extensions 10 years ago for my wedding. In the years since, I've done it off and on. A few years back I started using Latisse which works great for lengthening your lashes but doesn't do much for making them fuller or darker. (At least for me) I am very zealous with washing all my makeup off every night but no matter how many cleanses I do (micellar water + cleansing product) I still wake up with some kind of mascara remnant under my eyes which I really can't stand. I knew I was going to be in the pool on vacation and thought I would go get lash extensions again. What's great about them is that you don't really need to wear much makeup at all with them because they really define your eyes. No eye shadow, liner or mascara. I just used a bit of blush and lip gloss, highlighter and was done.